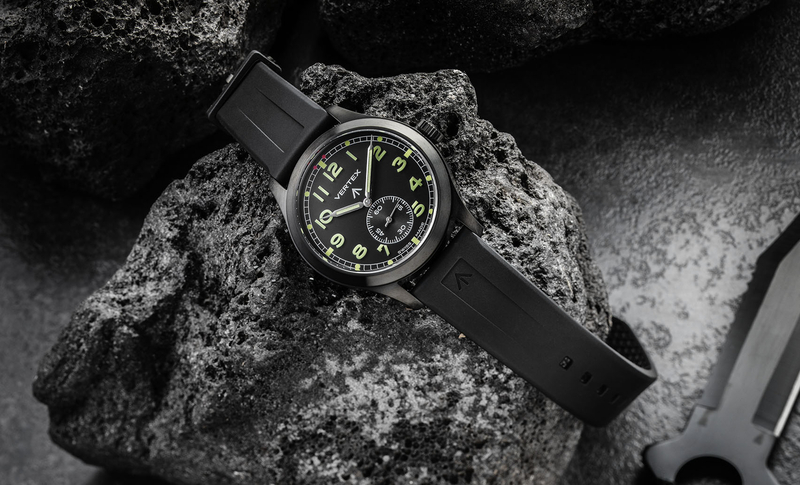 Vertex recently created a limited edition black DLC version of their M100 timepiece, which was inspired by the original “Dirty Dozen” W.W.W. British military watches, and that’s available for sale currently at Revolution. To give some background, the original “Dirty Dozen” watches refer to W.W.W. watches that were commissioned by the British Ministry of Defense (MoD) during World War II and produced by these twelve companies Buren, Cyma, Eterna, Grana, Jaeger-LeCoultre, Lemania, Longines, IWC, Omega, Record, Timor, and Vertex. These British watches are similar to Type 20s and B-Uhrs, which were commissioned for the French and German militaries, respectively. The Vertex M100B comes in the same 40 mm stainless steel case as the modern re-issue M100 with a new matte black DLC finish. The original W.W.W. watches varied between 35 mm and 38 mm, however, modern watches are usually much larger hence the choice by Vertex to go with a 40 mm diameter case. A modern hand-wound movement (ETA caliber 7001) ticks inside and drives the hours, minutes and small seconds hands. The 2.5Hz, 17 jewels modified movement (which has “Vertex” engraved on the Cal 59 style ratchet wheel) features bridges decorated with a Côtes de Genève finish, blued screws and it has a 46-hour power reserve. On the dial are unique, molded fully luminous applied Arabic numerals that mark all the hours except 6 o’clock, and there redundant dots on indices for each hour on the white printed train track-style minute ring. The hour and minute hands are filled with luminous material and are syringe-shaped (or pencil-shaped), which are arguably the best amongst the twelve in regards to legibility. Notably, some of the other Dirty Dozen watches used either Cathedral-shaped or sword-shaped hands. Included with the watch exclusively on Revolution is a complimentary 793-page reference book on the history of British military timepieces by Konrad Knirim called British Military Timepieces: Uhren der britischen Streitkräfte, as well as a Pelican case with two straps additional 20 mm straps: a bespoke rubber two-piece strap, and a red nylon NATO-style strap with DLC metal parts. While the original Dirty Dozen watches had “W.W.W.” engraved on the caseback, this solid screw-on caseback has only “VERTEX M100B” embossed in the center and the other standard hallmarks, such as water-resistance, which is 100 meters, around the perimeter. The Vertex M100B is available in a limited edition of 150 pieces (Ref. VER01441). Retail is $2,850 at the Revolution shop.